Today I’m excited to be bringing to the podcast Peter Shankman, a multiple-startup founder, best-selling author, and the creator of Faster Than Normal, a leading ADD/ADHD podcast, focusing on the benefits of being gifted with ADD/HD, which describes who Peter is. In this episode, we talk about Peter’s new book, Faster Than Normal: Turbocharge Your Focus, Productivity, and Success with the Secrets of the ADHD Brain, along with Peter’s story of how he’s learned how to not only manage his ADHD, but tap into the gifts that come along with the diagnosis. As the mama of a boy with ADHD, I loved this conversation and Peter’s infectiously positive attitude in the way he moves through the world. 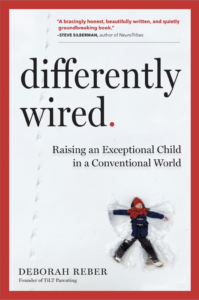 But even if your child doesn’t have ADHD or perhaps isn’t differently-wired at all, Peter’s perspective on the importance of self-knowledge and setting yourself up for success, as well as his ideas around productivity and creativity, are messages everyone can benefit from. About Peter: Peter Shankman is a multiple-startup founder with several successful exits under his belt. He’s a best-selling author, focusing on the customer economy. He’s the founder of Help a Reporter Out (HARO,) the world’s largest source/journalist matching tool, and he runs ShankMinds: Breakthrough, a private, online entrepreneur community with hundreds of members around the world, as well as Faster Than Normal, a leading ADD/ADHD podcast, focusing on the benefits of being gifted with ADD/HD. He can be found at www.shankman.com.